√ Bluetooth Mode: Bluetooth 3.0 Specifications, support HSP, HPP,A2DP,AVRCP format. With English language notification. √ Line In Mode: Connect the speaker by stereo cable. speaker will enter into Line in mode, and notification sound" LINE IN" . The use your smartphone or other connected device to play music. 1. It would be better that charge it before using it. 2. If you feel the volume is so feeble, don't worry. You need to increase the volume on your device firstly, and then use the speaker knob to adjust your favorite volume. 3. Tips: You can also connect computer via USB cable, and didn't need to plug the 3.5mm AUX cable. If it not work, please try to turn off the main speakers and make the soundbar the default in settings, but works great! 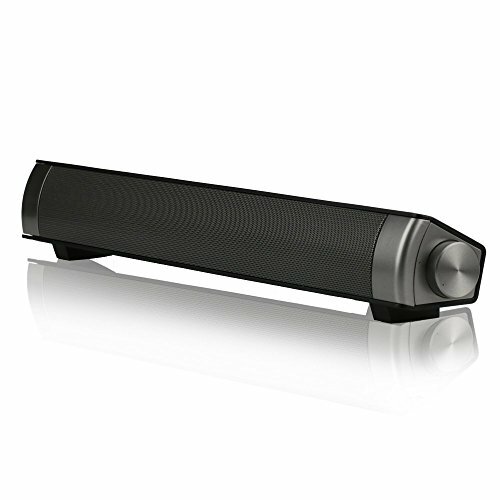 ♫ SOUNDBAR SPEAKER - Built-in Subwoofer to make sure high-quality sound. Powered by 2 x 5W drivers, distortion-free at maximum volume.Super bass stereo soundbar, noise reduction effect, perfect for home, dorm room, kitchen, bathroom, car, parties. If you have any questions about this product by ASIYUN, contact us by completing and submitting the form below. If you are looking for a specif part number, please include it with your message.